A few years back, in the days before former owner Craig Whyte ever darkened Rangers' door and in a time when Charles Green was selling his bombast elsewhere, I wrote a column about the nature of the Old Firm derby as I saw it. I called it a circus act, a freak show. I said it had all the weird fascination of one of those Victorian Odditoriums with Wang the Human Unicorn and Ella the infamous Camel Girl. 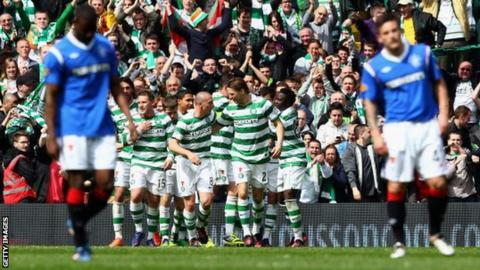 The appeal of an Old Firm derby is not so much the football but the grisliness surrounding the football. That's the marketability of this game - the rot. It's not known as one of the most storied derbies in world football because of the quality of the action on the field. Maybe it was back in the day - undoubtedly it was - but that hasn't been the case for a long time now. Those who get drawn to it do so because of its essential madness, its toxicity, its poison. That's an uncomfortable admission given the nature of some of the things that go on around this match - the bigotry, the violence, the viciousness and hysteria on social media. But it's the truth. At its craziest, it's football's equivalent of the Jim Rose Circus. And, love it or loathe it, for the next three months, there will be little escape from it. It's back - or soon will be. It was inevitable. Plenty have missed it. Plenty of others have not. It is possible to celebrate its return while also having an acute dread. That might seem like a contradiction, but in the strange world of the Old Firm, it makes some kind of sense. By the time it comes around, it will have been almost three years since the previous meeting of these two clubs. Expect that to be reflected in the acreage of newsprint and radio hours that will be expended on this Scottish League Cup semi-final. Before a previous meeting, I spent the week counting the number of newspaper pages given over to the fixture, from the Monday before to the Monday after. I gave up halfway through when the count had soared to over 100. One title had 27 pages dedicated to the game on one day alone. After a gap of three years, the mind boggles as to what lays ahead in terms of countdown. If you stop your stopwatch at the point when it was obvious that they would be drawn together, it probably it took a fraction of a millisecond for the first tweets to land, like blows to the jaw of their rivals. Some among the Celtic support are steadfast in their belief that a unique occurrence is going to take place next year - the first meeting of the sides. Something akin to virtual spontaneous combustion happened on social media. As commentators ran through the gamut of Things We Cannot Say (TWCS), there was a predictable and plentiful response. "Previous meetings" - there's been none. "Rivalry" - doesn't exist. "Rangers" - no such club. This coterie of Celtic fans say they see this League Cup semi-final as a match with no history. We must assume, by extension, that they believe the Celtic crowd at Hampden for the semi-final will be no more passionate and no more desperate for success than, say, a crowd at a Celtic v Dundee United semi; that victory, if it comes, will taste no sweeter than if it was Aberdeen they were playing. Just another semi-final? Really? Truly? Listening to the reaction from Celtic Park would have done nothing for those who hang on to the belief that next year's meeting will be the first of its kind. Respectfully, the very people at the heart of their own club do not agree. In the immediate aftermath of the draw, Ronny Deila, the Celtic manager, spoke about the renewal of the Old Firm derby. Stefan Johansen's comments were those of a man who believes that this is a continuation rather than a beginning. They're not alone. From the boardroom to the dressing-room, Celtic people have spoken in the recent past (sometimes off the record for fear of incurring the anger of some of the support) about Rangers not as a new entity but as a club they were looking forward to playing against again - if only for the financial benefits that will come with having their ground full and their media partners salivating anew at a minimum of four Celtic v Rangers matches every season. In the real world, the Old Firm rivalry lives on and we'll see it in all its dubious glory on 31 January or 1 February. It will look the same, it will sound the same. Victory and defeat will engender the same response as it always has - joy and despair on an industrial scale. Deila said something else when he was asked for his reaction upon hearing the draw. He said that that the game was three months away and as a result "it's a little bit early to be talking about it." God bless him in his innocence. Rangers manager Ally McCoist knows only too well what's coming and it's a media whirlwind the like of which Deila has never seen before in his footballing life. If he thinks his time at Celtic has been intense then it's about to build to a dizzying high. Deila needs to strap himself in. There's turbulence ahead.